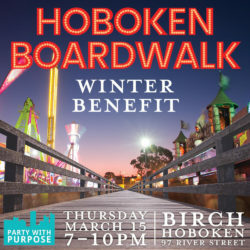 Party, network and celebrate at Birch Hoboken on March 15th from 7pm-10pm. Meet and help benefit some of the local children charities we donate to. You can make a difference in our communities while purchasing tickets, grabbing some friends, and joining us for great music, dancing, themed drinks and boardwalk fare. We are celebrating over 15 years and over $600K of donation to local charities such as the Boys and Girls Club, Jubilee Center, Jersey City Youth Foundation, Big Brothers Big Sisters, TRUE Mentors and over 15 other charities. Tickets are $80 for three hour open bar, passed apps, silent auction, tarot reader, caricaturist, photo booth and more!